Automatic transfer switch, 100A 120/240V relay based. Heavy duty relay assembly will handle 100A shore line/utility power and up to a 24kw generator. 120-240V AC, 100A per pole. 22-30 second nominal time delay allows generator to get up to speed. Time delay can be switched off for instant switching. Heavy duty terminal blocks for easy wiring. 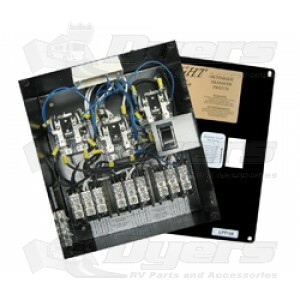 Utilizes a micro switch on teh neutral relay to ensure neutral lines are engaged before hot lines. DC coiled relays reduce hum and terminal blocks simplify wire connections.